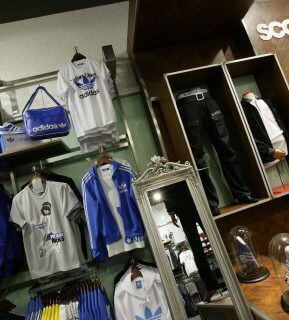 The brief from JD Sports was to create a new interior concept for their menswear retailer, Scotts. The underlying theme was: ‘Classic meets Contemporary’. This was used by D4R as the starting point to create the design concept. Key to the brief was the need to portray quality, craftsmanship and knowledge to consumers, giving them reassurance that the products they are purchasing are of a premium standard. The use of imagery such as a large factory backdrop, and various props placed around the display areas plant the seed of this in the consumer’s mind. The addition of details such as antique herringbone parquet flooring and reclaimed brickwork create an interior with a heritage feel that echoes the history, knowledge and quality of the Scotts offer. The integrity of the materials selected for the interior (such as the flooring and buttoned leather panels in the footwear area) instil the idea of quality and longevity, something essential when purchasing a premium product. Not to be forgotten was Scotts links to sport. This has been subtly expressed through the use of references to British sports and local heritage. Picture frames with images of local sports news-cuttings, local ‘legends’ and classic sporting events bring local history into the interior, so customers will feel it is ‘their’ store, and an element of their life has been immortalised in the store environment. More subtle details have been incorporated into the interior to echo the location, such as the reclaimed bricks and doors in the changing area being locally sourced. There is a definite atmosphere when you enter the store, helped by the reclaimed car light feature either side of the entrance. 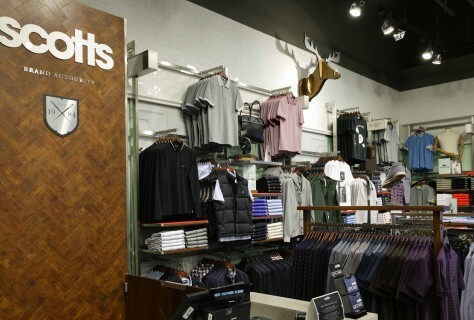 The feel of quality hits you as you step off the entrance matt onto the oak parquet floor, and are drawn into the store. 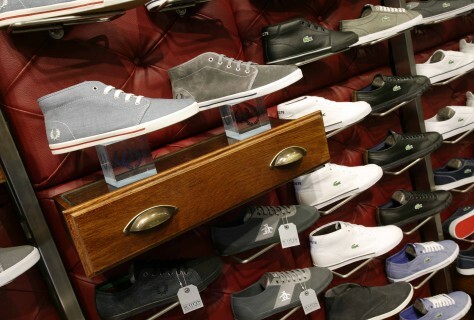 As in most clothing stores, the balance between shop-able product and visual merchandising is key. In the Scotts concept, this balance has been delicately achieved through the use of standard gondola displays and a perimeter system that also evoke the feel of heritage and quality. 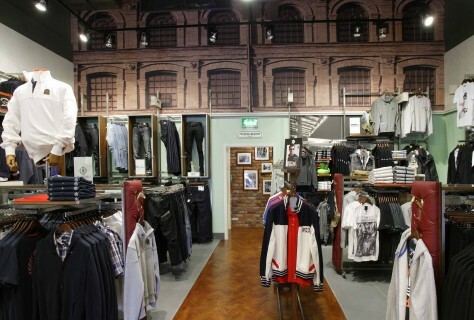 Thus, the more ‘standard’ elements in-store still tie in with the overall aesthetic. The effect achieved is one of a retail interior that feels like it has a history, and a purpose. Customers will feel comfortable and informed, and will leave feeling they have been treated to a premium shopping experience. 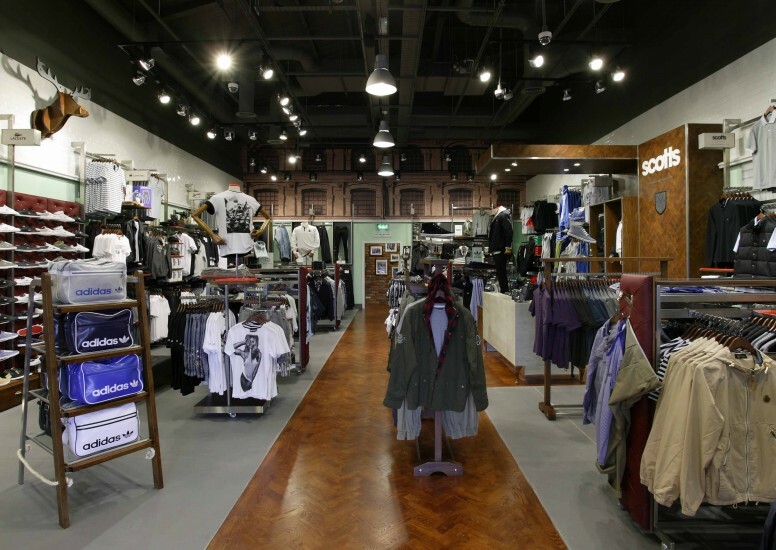 The Scotts tagline, ‘Brand Authority’ is a key message and the retail interior perfectly accompanies this through quality, ambience and design.